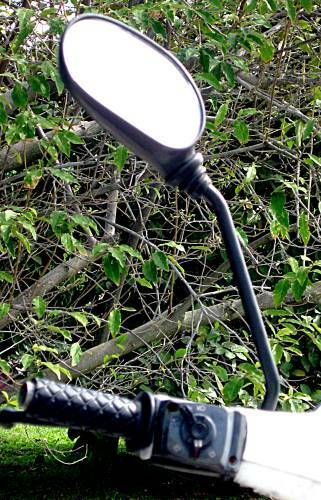 What should you be able to see in each mirror fitted to your motorcycle? 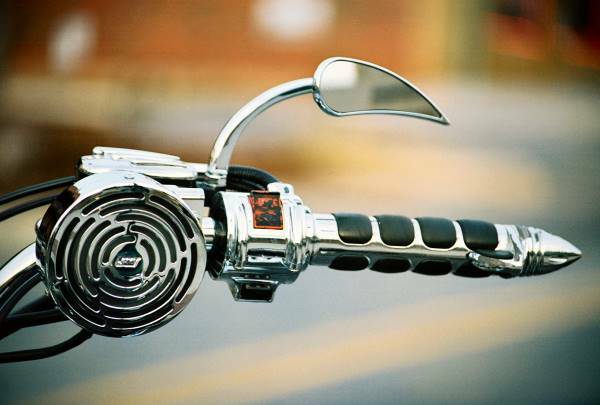 What should you be able to see in each mirror fitted to your motorcycle? A. Your shoulder and the lane behind. B. About half of the lane behind you and as much as possible of the lane next to you. 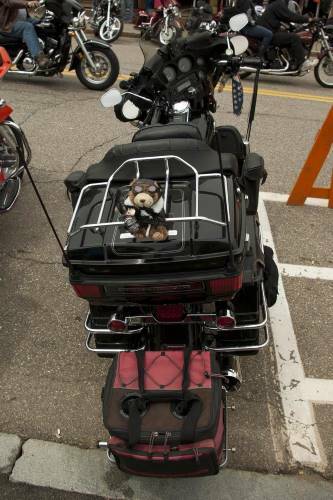 Your mirrors will change their angle and will be pointing too far downwards if you have heavily loaded panniers and top box (such as on the bike pictured to the left with its high top box and custom pink rear storage), or if you are carrying a pillion passenger as this puts more weight on the rear of the bike. Adjust them up slightly so that you can see behind you properly. If your mirrors are moving over time they may need tightening up. The wind will be constantly pushing against them if you don't have a faring or windshield. You can also replace your mirrors and/or mirror arms for ones that are more aerodynamic. If you do this, don't go for mirrors that restrict your view. Some smaller mirrors will have much less of a view behind you than bigger mirrors and this makes your blind spots bigger and means you need to look around you more frequently to keep a handle on what's going on with other vehicles on the road. As you can see from the images below, a highly customised mirror provides a much smaller mirror space than a standard mirror. A poorly sculpted set of mirrors can cost you about 0.025 Cd (coefficient of drag), which isn't much, but if you really are looking for the best aero performance, then change them as a motorcyclist on the bike itself already creates around 1.8 Cd as opposed to modern cars which create around 0.3 Cd. Remember also to keep your mirrors clean so that your view isn't obstructed, and that when you look in the mirrors the other vehicles that you see can be closer than they appear.